This picture shows complicated coal workers pneumoconiosis. There are diffuse, small, light areas (3 to 5 mm) in all areas on both sides of the lungs. There are large light areas which run together with poorly defined borders in the upper areas on both sides of the lungs. 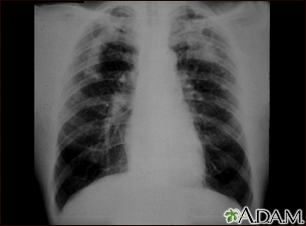 Diseases which may explain these X-ray findings include complicated coal workers pneumoconiosis (CWP), silico-tuberculosis, disseminated tuberculosis, metastatic lung cancer, and other diffuse infiltrative pulmonary diseases.